EDIT: Giveaway is officially over. Congratulations to the randomly chosen 88th commenter, Natalie! Summer is right around the riverbend! 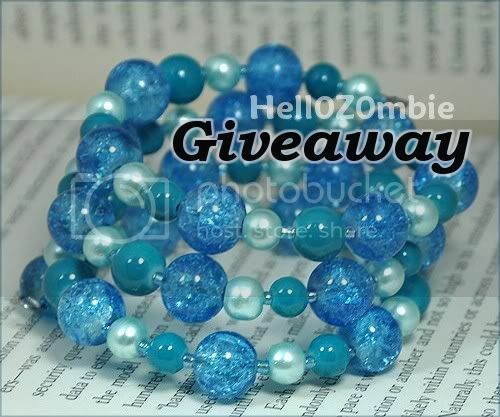 Emma of Hell0Z0mbie is giving away a blue bubble memory wire coil bracelet for one reader to hold the essence of water near, even when everyday life gets in the way of swimming and sunbathing. This fun accessory features a mix of tiny sky blue seed beads, baby blue glass pearl beads (vegan/cruelty free), teal colored beads and large semi-transparent "bubble" beads. The wire will take about three laps around a wrist, depending on circumference. The design is incredibly durable and easy to wear, as there is no fussing with a clasp. Although Emma specializes in memory wire coil bracelets, she creates other brightly beaded jewelry, including earrings and necklaces. She also carries handmade paper goods, tags and embellishments for scrapbooking. Giveaway is open worldwide. I will be pulling a number from my random.org top hat after 11:59pm EST on June 30, 2011, and the corresponding commenter will win! Emma will contact that lucky soul for a mailing address. If she doesn't hear back from the winner within 3 days, a new number will be drawn. Mandatory Entry: Stagger over to the Hell0Z0mbie Etsy shop then comment on this post with your favorite handmade item and a way to contact you, preferably an email or Etsy shop. 1. Like the Hell0Z0mbie AND aquariann Art pages on facebook. Liking both counts as one extra entry. 2. Share this giveaway on facebook by using the like or leaf icon on the bottom of this post. Leave a comment with your profile link. You may do this once a day. 3. Follow @hell0z0mbie AND @aquariann on twitter. Following us both counts as one entry, as long as you leave a comment with your own username. 5. Follow Emma's Things That I Like blog AND my blog on Google Friend Connect, Networked Blogs or your favorite RSS reader for another entry. Love the Lucky Cat Earrings, purringly cute, meow! Already follow both blogs with gfc, thanks for the lovely giveaway. Voted, top 20 now, woot! Like both on FB (jc loh), thank you. I adore the Green and Pale Pink Crystazzi Pearl Memory Wire Choker! Voted for you - you're #18 now :-) ! My favorite is the Muted Green and Earthy Pastel Memory Wire Coil Bracelet. The Pink Skull Earrings are cute! I like the Soft Blue And Green Memory Wire Bracelet. I like HellOZombie and Auariann Art on Facebook. My fave is the Blue & Magnetic Memory Wire Coil Bracelet. I really like the Green and Silver Memory Wire Bracelet!! My favorite is the Purple and Yellow Grunge Glass Pendant. My fav is the mostly pink and green memory coil bracelet! I like Smaill Black and Blue Memory Wire Chocker. Liked the Hell0Z0mbie and aquariann Art pages on facebook!! Followed @hell0z0mbie and @aquariann on twitter!!! The pink cupcake earrings - so cute! Followed Emma's Things That I Like blog and your blog on Google Friend Connect!!! My favourite is the Simply Repeating Rainbow Memory Wire Coil Bracelet! Hello and TY for the opportunity! I just voted for you at Picket Fence Blogs! I submitted the post to Technocrati! Love the pen-n-ink skull ACEO. Thanks. Oil Slick Memory Wire Bracelete = Great! I love the Green and Pearl Dangle Earrings. Purple and Pink Glam Memory Wire Coil Bracelets is my favorite. I like the http://www.etsy.com/listing/50018920/blue-ocean-memory-wire-bracelet Super cute! I love the Pale Pink and Green Crystazzi Pearl Memory Wire Choker...beautiful! I like the bright and bold rainbow bracelet. My favorite item is the Simply Repeating Rainbow Bracelet! I like the Pink and Purple Crackle Bead Memory Wire Bracelet!!! Liked the Hell0Z0mbie AND aquariann Art pages on facebook. Followed you both on Twitter. Followed both of you on GFC. I like the Fourth of July Memory Wire bracelet. Love the coral coloured candy wire coil bracelet! I am feeling lucky, Thanks. I love the Uber Rainbow Memory Wire Bracelet - it's so bright and fun! Love the Blue Ocean memory bracelet! I voted for the 2nd time. The Rainbow Memorywire Necklace catches my eye. My fave is the Bright & Bold Rainbow Memory Wire Coil Bracelet. I Like the Hell0Z0mbie AND aquariann Art pages on facebook! Love the Blue Ocean Memory Wire Bracelet! I like the Uber Rainbow Memory Wire Bracelet. I follow your blog and Emma's Things That I Like on GFC.